If you’re a renter like me, you’ve heard this from well-meaning homeowners: you are “wasting your money” renting instead of taking advantage of this all-time-low housing market and its super-low interest rates. You could be putting all that rent money into a mortgage and soon enough you’d own that house instead of walking away with nothing. And okay, I get it. For a long time, owning a home was an Investment. It was meant to be not just a place to live, but also a place that you could, one day, hand down to your children. (Or at least mortgage the heck out of it for your children’s college education.) You were building equity and the home was gaining value and some day, perhaps many years from now, you would get more out of the house than you put into it. I live in California. The average home valuation in my city, even in these times, is $463,000. Using the handy NY Times calculator and putting that housing cost against my current rent, do you know where I am at the end of 30 years? $200,000 poorer (but with a house for my trouble). Emotionally, having a home may seem like the right thing to do but that’s clearly not the case for me. In a way, this is a problem that small business owners face as well. Do you contract an agency or SEO consultant for your search marketing efforts (rent) or do you put a ring on it and hire an in-house employee (buy)? Let’s take a look at a few pros and cons to get started. Controllable cost — You’re a small business who can’t afford to hire, train and maintain another person on staff. Hiring an agency gets you an expert who is ready on Day One to make improvements to your site and help you build traffic and brand. You don’t have to pay health insurance on your rented SEO. That’s someone else’s problem. Short-term relationship — Feeling confident about your ability to do it yourself? Unhappy with the results you’re getting? Contracts with consultants and agencies are usually designed with end dates in mind. You’re not locked into anything. Only 20 hours a month! — Your SEO campaign isn’t going to happen overnight but that’s okay. You only need a few hours a month to keep going and you’re only paying for what you’re using. No buy-in — The agency is in business to help your SEO efforts but they are not living and dying by your success. Short-term relationship — Some people stay with their agencies and consultants forever but that’s not always the case. Agencies go out of business or raise their rates, consultants move away, change their specialties. You have no obligation to them but they have no obligation to you either. Only 20 hours a month? — Your SEO campaign needs attention but you can’t afford any more time this month, so you don’t get any work done. 40 hours a week – For what is usually far less an hour, you can hire an employee to devote every waking hour to making your site succeed and there’s no arguing about who’s the boss. SEO, Web designer, fetcher of coffee – Your inhouse employee can wear as many hats as she has time in the day. Don’t need 20 hours of work this month on SEO? That’s okay, she can also write up some PPC ads, run your analytics program, write press releases, help out with customer support, even make coffee in the morning. In-house means in the building – Your in-house employ, the one making coffee, is literally in the house. When something goes wrong or you have a question, it’s a matter of walking down the hall not calling across the country. Their schedule is your schedule. SEM Training – it’s a rare hire that comes in with 100 percent knowledge. Your best case is picking up a consultant who wants to go in-house; but most of the time, hiring an SEO means hiring someone with knowledge of the Internet that you can train to be an SEO. So you end up spending time and money on SEO training courses. Search Industry Research – Keeping up with Internet marketing is a full-time job, one that you’ll be footing the bill for. Search marketing changes every week and that means constantly doing research and testing to keep up. While agencies and consultants absorb this cost as a matter of staying in business, a small business may not be able to support the cost of staying on the cutting edge of the industry. Desk space – the flip side of your SEO being in your building is that he’ll need a place to work, he’ll need equipment, he’ll need all sorts of things. If you’re a small business and your office is just the space you’ve cleared in the backroom, you might not have space for an SEO, even if he does make a mean latte. Obviously, the answer is going to depend on your business, your market and your life. What makes sense here in California might not make sense in Ohio, and the right choice for Beth’s Auto Emporium might not work out for Todd’s Teahouse and Spa. The one option that isn’t on the table is going homeless. You need an online presence and that means investing in SEO. Comments are closed on this post. Join us over at 5 Things Businesses Should Know About SEO Agencies for more discussion on how in-house and agency SEO can work together. Having worked both in-house and now for an agency I’ve seen both sides and you’ve got the pros and cons covered well there. If it was MY small business, I’d hire an agency, simply because of cost issue. Being in-house and doing more than ‘just SEO’ still didn’t justify my salary (and I was honest enough to tell my employer that and move on! ), whereas having an agency does, as you say, allow you to control the cost. For a small business, it’s all about the bottom line. That said, as you grow and you need more time spent on SEO, getting a full time in-house employee could be the way to go if you can justify the cost. I agree, Brent. I don’t think there’s any substitution for someone in your company knowing about SEO. In fact, I think you have to have someone even if you are working with an agency. There’s just too much potential for disaster if you don’t know the basics yourself. Training is SO important. Buying training for your employees can be a better investment. Teaching your own staff the fundamentals can mean good visibility for years to come. Too many people focus on the right now to realize it’s even an option. Nice article! Another cons of the outside (agency) SEO is that they usually have the limited pre-selected vendors they will hook you up with. For example link building is a complex task and it is far better to go with several vendors vs one link building company. An agency would prefer to use their own internal resources or one vendor they already have a partnership with. In-house SEO will always be on the lookout for new resources out there and will test everything. Well, obviously, I’m going to be a little biased here, being that Bruce Clay, Inc is an Internet marketing services company and ‘what’s a good SEO company’ could be a whole post on its own but I’ll try to keep it concise. The first thing I think you’re looking for is experience. I don’t just mean years in the industry but actual hands on work that’s consistent and continuing. You want someone with a strong commitment to education and ethics — there are a lot of shady companies out there (that’s why SEO gets a bad rap after all) and getting into bed with one without knowing what they stand for is a bad idea. I think you want someone who is going to be honest with you. If they’re guaranteeing rankings or promising instant results, they’re lying. If they’re going to tell you that you can rank for your most competitive keyword in 6 months, they’re probably lying or they’re planning on spamming. We really strongly believe that a good SEO company is going to engage in knowledge transfer. If you’re handing everything over to an SEO company and they never ask you to understand what it is that they’re doing, that’s not valuable to you. I think you want someone who can handle all types of sites — big, small, local, global, niche — and has the portfolio to prove it. I’m sure there are lots more criteria that people could add so I’ll leave it here. So my question for the author is. What is a good SEO company? I ask because I handle a ton of affiliates and I have never had an affiliate tell me WOW this is a great SEO firm. Most of the time I hear well I spend 30k ove rthe last 6 months and nothing has changed. I would say from experience in the field for over 8 years that most SEO companies are scams. Oh they seem great at first, well at least there sales pitch. But month after month and nothing, only to lose tens of thousands of dollars. I am not a big fan of ranting or switching SEO consultants. I don’t mind paying a bit more but want to stick someone I can work with. We absolutely have that relationship with some of our clients and when it works out that way, it’s an awesome thing. The advantage of hiring outside the company is that you can tailor that relationship to be as close or hands-off as you like. Not something you can get with an in-house solution. Hey Susan, you forgot one thing: the perfect balance between these two! We have a few clients (mostly already working on distributed teams) that treat us just like their employees. They pay us a ton of money to handle everything for them, they trust us completely, and we’re able to dedicate a lot of time to making their sites better. I’m even copied on internal emails to share my ideas with their team. Does anyone else have that relationship? Doing it yourself is also an option. That’s another cost to your business, however. It means you have to be the one taking the training courses and keeping up with the industry. Usually small business owners are busy enough with their first job that taking on a second is overwhelming. I always like to do things myself – but then again I don’t have big online business to worry about… Thank god! SEO is so important, you don’t want to get it wrong. If you don’t know much about it, hire someone. Thanks for dropping in. Great points about core competency versus risk. That’s something you have to be wary of no matter what your business is, of course. Training up a superstar usually means accepting that your superstar may outgrow you. You hire someone with raw talent and a little experience. You spend time and money to train her up. She’s good and she realizes how much she can make somewhere else- after all, she came in as a trainee, and leaves as an SEO ninja. So, you have to hire and go through the cycle again. This is not to say you should not “buy”- but I’ve seen this scenario quite a few times. Again, great post, and I agree with most of your points! Miles, I think you’d be surprised by how many SEOs there are out in those rural areas but you’re right that it does seem like you’re fishing in the wrong pond. For small businesses, I really do think that unless they’re lucky enough to find someone really amazing, they need to also hire an outside consultant, if only just to keep things on track. I agree Andy 100%, but maybe I’m biased too – it seems to me most small/medium sized companies are less likely to attract someone experienced to an in house position unless they’re offering very good levels of compensation – I feel SEO is not a game for beginners working alone. More importantly these businesses are unlikely to be in a position to judge candidates levels of expertise and knowledge in the field. Got to say, a few times I’ve seen job ads for in house SEO positions at small/medium sized businesses in things like local newspapers (in a fairly rural area), it’s difficult to imagine they will have a single good candidate applying. I think it really depends on the business. A business that relies completely on being online may need that full time Internet marketing person on staff. But the local cupcake shop probably just needs a few hours of consulting a month. I’m biased, but for the majority of small businesses, you’re best outsourcing SEO. For a start, you’ll get someone with experience (and hopefully a few people on staff to come up with strategies and solutions one person might miss), and you’re not tied to a new employee. That said, I can see why people want in-house SEO, but if you’re a small or medium business I can’t imagine it being cost effective. I agree, the try before you buy option is a good one. To belabor my rent vs buy analogy, it gives you time to learn the area and figure out where you want to live. Jumping in blind can lead you into scary neighborhoods really fast. I personally think, for business that are not completely sure what SEO is about, it’s better they acquire service from agency first to get a bit of the flavor how to increase their online presence. Many agencies provide training as well, once small business owners are confident about the process of site optimisation, can always hire an inhouse SEO to take over. 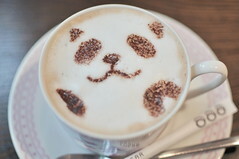 I like the panda chocolate sprinkle on top of the coffee by the way, cute! Great points! It really depends on what product or service the company handles. But if they can afford it they should go in house and invest for the long run. That is how we operate, partnering with an agency. They have more case studies to draw from so we don’t have to waste time testing different strategies. They also help validate what we are doing to the executive team. That being said, the greatest benefit has been them helping with bottlenecks in IT! Great points. I also left out an awesome solution which is having it both ways. There are plenty of big companies out there that have an agency to consult and an in-house team to implement. Sometimes you need both to get the whole picture. The trouble is that having it both ways doubles the cost, not feasible for smaller businesses. I really like in-house as a solution if companies can afford it. It shows a commitment to SEO that I think is really important. I am in-house internet marketing manager for a mid-size company so my opinion is informed but biased. There is more to internet marketing than just SEO, obviously, so I think the real question is in-sourcing vs out-sourcing the entire internet marketing department. If the internet marketing dept. is in-house than hiring an in-house SEO is a no brainer. In my opinion, the biggest factor in the decision process is the size of the business. It’s hard for small business to take on more employees of any sort and over sight is always an issue. SEO is French to those not in the business, how do you manage a position you don’t understand? However, if your a mid-size to large company and doing SEM, SEO and SMM then bringing in an internet marketing team is the way to go.